Daylight Savings Time was last week,which means longer days and warmer weather are quickly approaching. For fair weather runners, it’s the perfect time to put those winter boots away and bring out those runners you haven’t worn since last September. Running season is officially upon us! 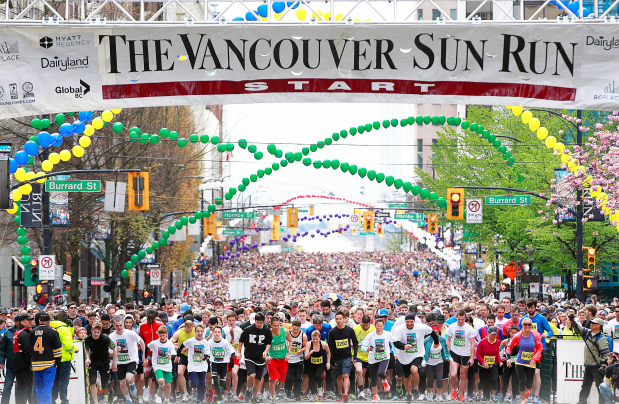 For you keeners that signed up for the Vancouver Sun Run in January, isn’t it nice to not be running in snow and slush? 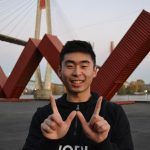 For anyone new to The Vancouver Sun Run, it’s a 10 km course that takes you through some of Vancouver’s most spectacular views. It is currently the largest 10km race in Canada and the 3rd largest timed 10km in the world. It is a perfect race for individuals of all skill levels and is sure to leave you with plenty of positive memories. However, a 10km run requires an adequate amount of training. With an increased amount of running, you increase the risk of injury on your body. Below are the three most common issues seen in runners. Shin splints is probably the most common injury amongst runners. It is felt as pain below the knee on the anterior (front) and medial (side) part of the lower leg. Basically the front of your shins. It is usually associated with running downhill, uneven surfaces or improper running technique. At the onset of shin pain, running should be discontinued immediately as that can further aggravate the pain and sorry, “slow” running won’t help it heal. The recommended down time is two weeks to allow for a full recovery. Low impact activities such as swimming or cycling can be performed to maintain your cardiovascular fitness until the pain subsides. Methods to alleviate pain include icing your shins to reduce inflammation. A simple exercise that one can perform in a sitting position is tracing the alphabet with your toes. This can be used as both a preventative and a recovery measure. 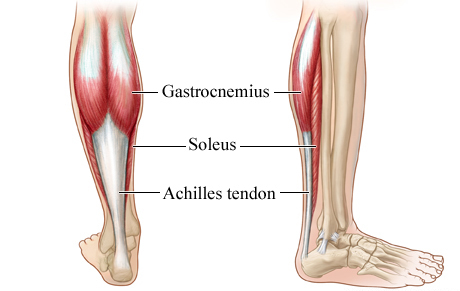 Achilles tendinitis is the swelling and inflammation of the Achilles tendon which connects the calcaneus (heel bone) to the gastrocnemius and soleus muscles of the lower leg. It can be caused by repetitive stress on the tendon without adequate rest. The most important step to recovery is to scale back activities that aggravate the tendon (i.e. rest) , but if you must exercise, stick to low impact activities. Ice should be used up to, but no more than 20 minutes at a time, try not to let any areas being iced become numb. Ice is great if heat and swelling area present in the area. 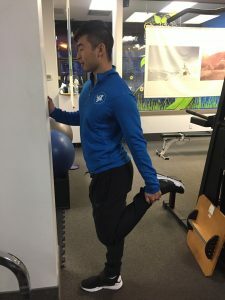 Stretching the calf complex can be a helpful way to alleviate pain. Start by placing your feet hip-width apart and putting your right leg directly in front of you. 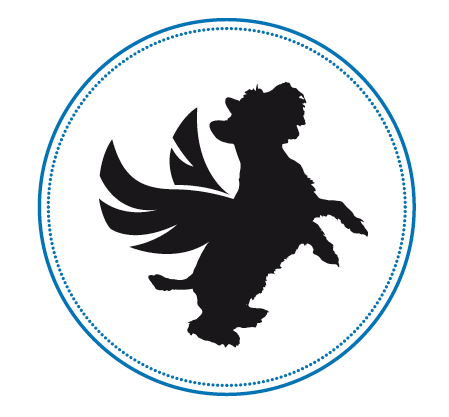 Step back with your left leg, keeping your leg straight and heel on the floor. Lean into the wall until you feel a stretch your calf of the back / left leg. Switch sides and repeat. Runner’s knee is a catch-all term for Patellofemoral Pain Syndrome (PFPS) which can be classified as any pain or tenderness around or behind the kneecap. It typically occurs due to repetitive force against the ground, running downhill, improper running technique and muscle imbalances. A good way to decrease chances of getting runner’s knee is to train on softer surfaces such as track and turf fields. If running on concrete is unavoidable, limit substantial mileage increases, check your technique and ensure you have proper footwear. The hip flexor stretch opens up the front of the hip which can help with your running posture. Kneel on your left leg and take a big step forward with your right leg. Lean forward and towards the right to feel a stretch, then switch legs. 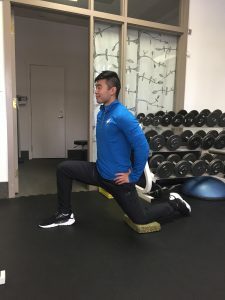 The standing quadriceps stretch helps to lengthen the front of your thigh with the goal to reduce pressure on the knee joint itself, and open up the hip. Standing near a support for balance, bring one heel up behind you and grab the foot/ankle with the same hand. Ensure your posture is tall, hip is pushed forward and knee is pointing straight at the floor – you should feel it in the front of your thigh, without any pain or discomfort in the joint. Hold each stretch for 30 to 60 seconds and remember to breathe! If you have any questions about running technique, recovery or footwear, drop us a line below and we’ll be sure to get back to you. If we missed any of your favourite running stretches, tell us in the comments. 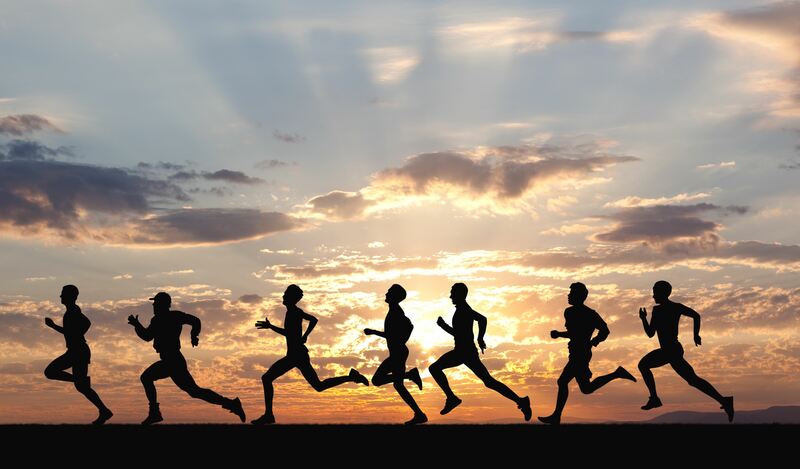 Good luck with the rest of your Sun Run training and have a great race! When i was started running i felt severe pain in my knee. Later on, searching solution of pain i found your blog and found many valuable tips for best and fast running. Thanks for sharing informative tips and information.